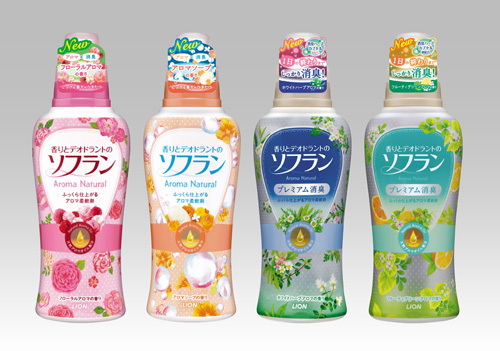 Lion Corporation (President: Itsuo Hama) announces the nationwide release of improved Kaori to Deodorant no SOFLAN (SOFLAN with Fragrance and Deodorant) Aroma Natural on March 11, 2015. This lineup of fabric softeners for clothing eliminates unpleasant odors and contains natural fragrances that make doing the laundry more enjoyable. Now, Lion has enhanced the lineup’s premium deodorizer type products by introducing a new fragrance option as well as a new product formulation featuring a duo of deodorizing ingredients for longer-lasting odor fighting. The package designs have also been completely revamped. The fabric softener market is expanding about 6% per year. A Lion survey asked users of fragrance- and deodorizing-type* fabric softeners whether they place higher priority on fragrances or deodorizing. The results showed that user priorities were divided almost equally: 48% of respondents prioritize odor prevention and elimination, while 40% prioritize fragrance. Lion’s Kaori to Deodorant no SOFLAN (SOFLAN with Fragrance and Deodorant) Aroma Natural fabric softeners are formulated with natural aroma oils to make laundry more enjoyable and have been well received by consumers. The product lineup comprises a fragrance type that features pure aromas and a premium deodorizer type that is highly effective in eliminating odors. Now, Lion has reformulated the premium deodorizer type, augmenting its nano-deodorizing ingredients with the addition of new deodorizing herb capsules for the longer-lasting elimination of unpleasant odors, including sweat and body odors. Furthermore, Lion has added a new fragrance option to the premium deodorizer type, the fresh and soothing Fruity Green Aroma. Lion continues to offer consumers ways to make laundry more pleasant by eliminating odors and enjoying natural aromas. In addition to the nano-deodorizing ingredients used in the previous formulation, the new premium deodorizer formula includes deodorizing herb capsules. The nano-deodorizing ingredients penetrate deep into fibers to effectively remove odors caused by sebum and sweat, while the deodorizing herb capsules suppress odors that arise while clothes are being worn, for effective odor control that lasts all day long. To complement the existing White Herb Aroma, Lion has added a new fragrance, Fruity Green Aroma. This soothing fragrance combines jasmine and other fresh scents with the aromas of green apple and green foliage.